Malaga is a great city. It has everything from beaches to mountains and of course great bars and fabulous restaurants. For us though, what makes the city so special are the barrios, the neigbourhoods, where the Malagueños actually live. This is where you really get to experience the rhythms of daily Spanish life, and of course where you can put your growing Spanish skills into practice. Our neighbourhood is bustling with everyday people going about their everyday lives. With culture and history at the heart of the area, it’s as real as you can get and we wouldn’t have it any other way. 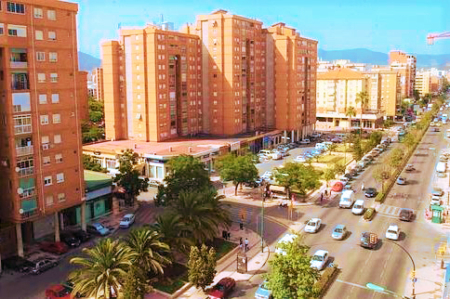 What was once simply the road towards Cadiz (it was literally called ‘Carretera de Cadiz’), the road Avenida de Velazquez has developed into the home of many neighbourhoods in Malaga such as El Torcal, La Luz, La Paz and more. The metro and many bus routes pass through the street connecting the airport and the historic centre of Malaga. Years ago, the city’s workers came here from all of Spain’s provinces for industrial work, which is still evident today from the chimneys. The locals tell a famous love story, about the Torre Monica – where a young man climbed a chimney to paint his girlfriend’s name in big letters to impress her. 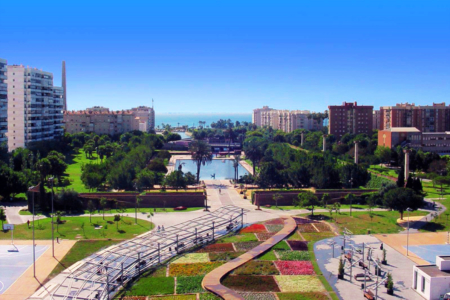 The people developed the area into a community, and tourism in Malaga wouldn’t be what it is today without them. Our Parque del Oeste has something for everyone. Priding itself as being a ‘park for everyone’, there’s many things to see and do here. You can find a big lake with pretty water features, calm and quiet paths surrounded by green trees and the aroma of flowers, pathways for joggers and cyclists and a variety of statues and sculptures. However, the park also has courts for playing football, basketball and more for public use. It even has a mini-zoo with exotic animals such as emus and wallabies, so there’s plenty here to do with your friends – or you can make new ones! The ice cream parlour known locally as ‘Heladería Inma’ is one of Malaga’s most beloved places to eat sweet by locals and tourists alike, with its popularity securing the business a ranking of number 3 out of 50 dessert places in the whole city on TripAdvisor. The Malagueño favourite seems to be the Kinder ice cream, but there are over 40 delicious flavours in total to choose from and try out. Sounds like a good excuse to go back for more, right? 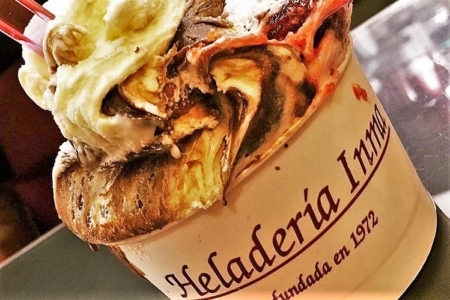 Heladería Inma is also often praised for the high quality of their ice cream, with its beautiful soft texture, while having fair and reasonable prices. One of the many places for food and drink along Misericordia beach is the Chiringuito Amitabha. 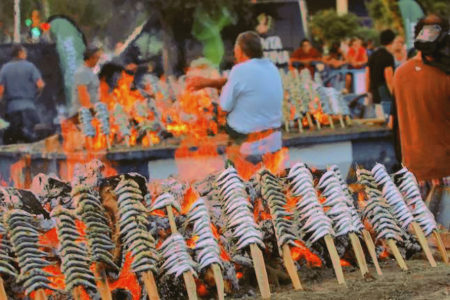 It’s a very popular place due to the appeal of the way the fish are cooked on traditional open grills while you watch the dancing flames and take in the smell of the charcoal fire. The Chiringuito hosts live music performances for its audience too – the sunbeds and parasols are also popular with beach-goers for relaxing in the sun while enjoying the vibrant atmosphere and drinking cocktails. 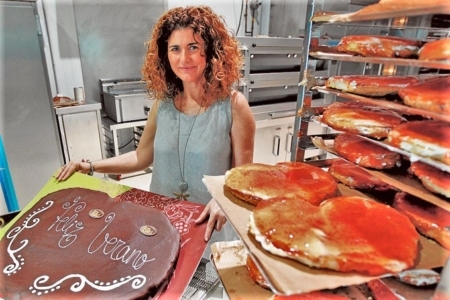 Years ago, this bakery began as a French, family-ran business in 1967, and Malaga later welcomed the Panadería Christian in 1985. Selling traditional Spanish cakes, mini sweet treats and freshly baked bread, it’s a popular location for both tourists and locals. 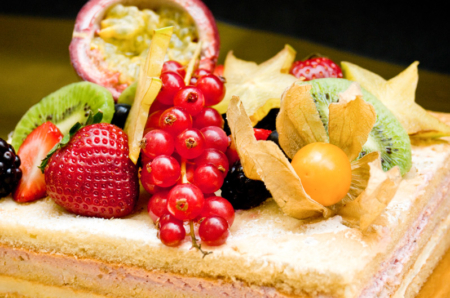 The bakery also offers a delectable range of seasonal and innovative desserts, keeping up with the buzz of the Malagueño lifestyle. Another bakery popular with residents and visitors is Casa Kiki – famous in Malaga for their giant ‘palmeras’, Kinder again being a very popular flavour. People travel here from all over to buy them! It is a sweet, flaky pastry with a cream filling, then topped with either a thick layer of silky chocolate or a sugary icing glaze. That’s not all – freshly prepared sandwiches, breads and other traditional cakes are also sold here, so make sure you stop by. Malaga’s contemporary culture centre, La Térmica, is where to go if you’re looking for something different to see and do. The large building hosts exhibitions, workshops, concerts, theatrical performances and more all open to the public and visitors to attend. The organisation supports local artists too, by letting them create and display their work cheaply. There are even spaces in the beautiful building for people just to meet, talk and get work done due to the fact that Wifi is free. 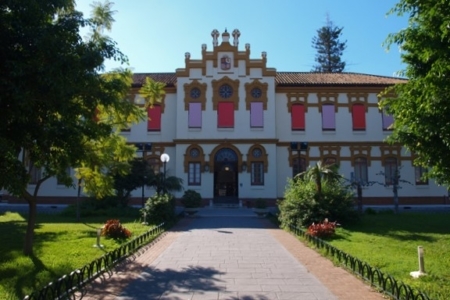 One of Malaga’s best museums is the Museo Automóvil y de la Moda, ranking at number 2 out of over 200 things to do in Malaga on TripAdvisor. And the reviews don’t lie! 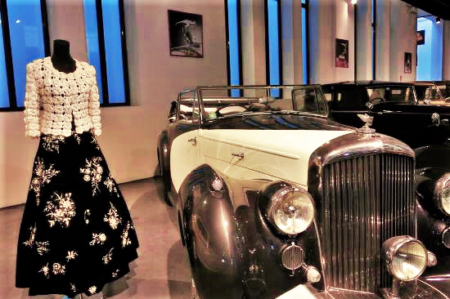 Visitors can find displays of luxurious vintage cars exhibited next to the avant-garde and haute couture pieces, arranged in careful compositions in front of hanging art posters and works. It’s easy to lose yourself in the world of glamour they have created here. A walk down Avenida de Velazquez will take you past many mini markets and fruit shops all ran by the locals of Malaga. The window displays are lined with an array of vibrant colours from the vegetables and fruits. 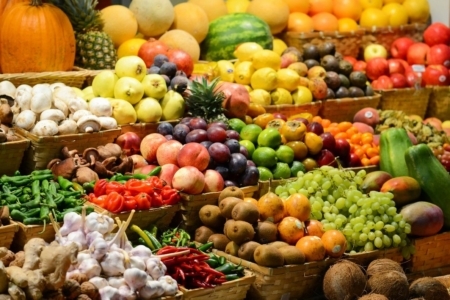 Although the area is also very modern and urban, small businesses selling fresh produce survive here thanks to the Malagueños who live and work in the neighbourhoods of the area, emphasising a real sense of community spirit.